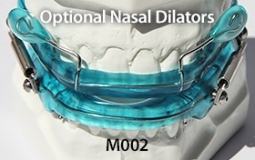 The OASYS Hinge Appliance is a FDA 510K Cleared Medical Device, and is approved by PDAC Medicare E0486, (OASYS Hinge Appliance M001, OASYS Hinge Appliance Nasal Dilators M002 and Oasys Hinge Appliance Nasal Dilators / Tongue Lifters M003—Dream Systems LLC E0486 07/02/2015). The OASYS Hinge Appliance includes the OASYS T-10 Hinge with 10mm of advancement. 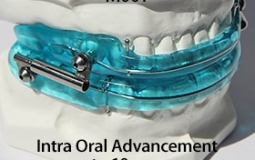 The T-10 Hinge is a smaller profile hinge, which allows for more flexible placement, even in shorter arch cases. It is also a telescope designed hinge that does not come a part with full extension. 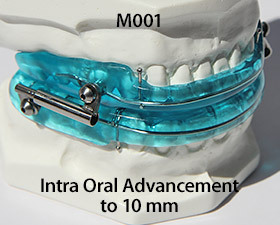 It provides 10 mm of advancement, in comparison to the current 5mm hinge. It is designed for intra-oral activation, in comparison of side activation out of the mouth. One half turn (12:00 to 6:00 clockwise) = 1/4 mm using a 1.27mm hex wrench; one full revolution (12:00 to 12:00 clockwise) = 1/2mm; and 2 revolutions clockwise equaling 1 mm advancement. 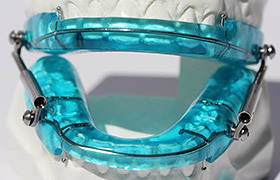 (16 Clicks = 1mm Scheu Hinge). 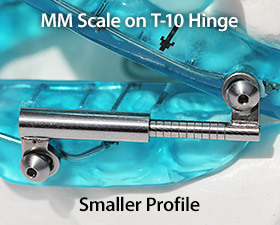 The T-10 Hinge has etched mm marks on the hinge for identification of advancement, compared to the Scheu hinge which does not. 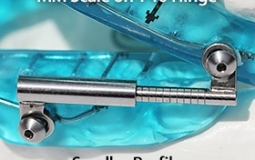 There is a Nylock coating in the hinge chamber to prevent backing off of the screw, plus a welded stop to prevent the screw from ever coming out of the chamber. The Hex Wrench will activate the hinge screws for advancement and also is used for tightening or loosening the hex screws on the pivots. 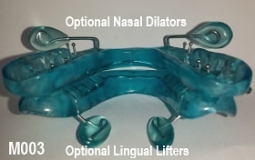 The OASYS Hinge can also include the benefits of the OASYS Oral Nasal Airway System, with the available options of theNasal Dilators and Lingual Tongue Lifters Nasal Dilators and Lingual Tongue Lifters.